Or a Chipotle burrito bowl with spicy salsa. I really just want to CHEW something. They warned me this would happen… so I had 2 bars today instead of my usual 1. It helped a bit. I think it’s funny that what I’m craving is chewy protein and not what I normally crave when I’m dieting. Normally I want macaroni and cheese (I’d settle for cheese). Or pizza (again…cheese). Or pasta bolognese (I’d love just a bowl of the sauce). Everything, with the exception of my one bowl of soup a day, is sweet. The shakes are sweet, the bars are sweet, the other shakes are sweet… I can change the type of sweet, or amount of sweet, but it’s sweet. And I’ve already decided that the FIRST thing I’m cooking when I’m back on solid food is my favorite bolognese sauce atop spaghetti squash. 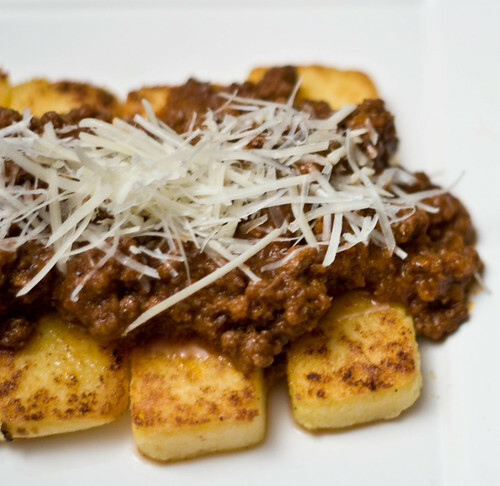 Or polenta. Yep. That’ll do. It’s so not nice to post pictures like that! lol. Wishful thinking… It’s at the finish line! Thanks Jessica! I’m hopefully getting one meal back in about 4 more weeks. But I’m not sure.